SINGAPORE - Saleswoman Noriza A. Mansor has been named the first Straits Times Singaporean of the Year. Madam Noriza, 50, beat nine other contenders to the title, which seeks to recognise Singaporeans whose extraordinary acts of goodwill, ingenuity or perseverance improved their community and the lives of others in 2015. Her win was decided after a public vote and deliberation by a 15-judge panel. 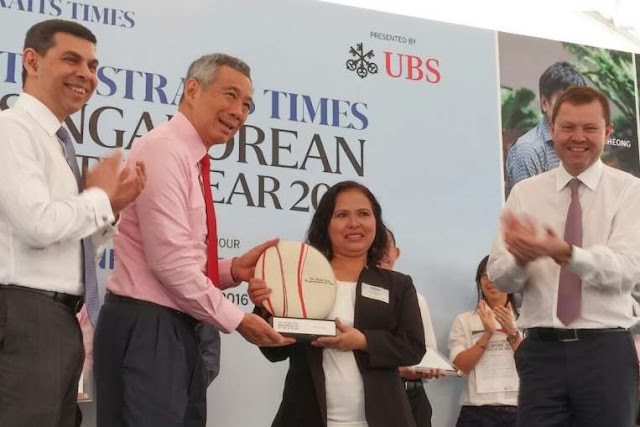 Prime Minister Lee Hsien Loong presented the Singaporean of the Year trophy and a $20,000 cash prize to Madam Noriza during a ceremony at the UBS Business University on Tuesday (Feb 2). The single mother of five attended the ceremony with three of her children, as well as her future daughter-in-law. Madam Noriza, who works as a bedsheet promoter, made headlines in October 2014 when she stepped forward to help an elderly man who had soiled himself while buying groceries with his wheelchair-bound wife at a Toa Payoh supermarket. Others had recoiled from the man and his stench, but Madam Noriza's subsequent acts - she knelt down to wipe the dried faeces off his legs and bought him new shorts - moved a bystander to tears. She did not stop there, however. Since that day, she has regularly used her days off to visit Mr Tan Soy Yong and his wife Madam Lee Bee Yian, both 70, even after they were moved into nursing homes. Orphaned when she was 21, she said she considers the elderly couple to be like her adopted parents. Madam Noriza said of her win: "I'm speechless. I feel very happy but also a bit sad because uncle (Mr Tan) could not be here today. But I felt like he was here beside me when I went on stage. "I hope everyone will do something like me and not ignore people who are poor and handicapped. Actually, they don't want to be in this kind of situation. Don't neglect them." She intends to use some of the $20,000 prize money to renovate her four-room HDB flat in Tampines, and will save the rest for her children. The other candidates for Singaporean of the Year included sales consultant Ang Thiam Hock, 52, engineer Peter Ho, 37, and Paralympian swimmer Yip Pin Xiu, 24. They each received $5,000 from sponsor UBS. with the Straits Times Singaporean of the Year trophy. Madam Noriza A. Mansor got to know a 76-year-old after helping him when he soiled himself while out with his wheelchair-bound wife. In a nursing home ward, Mr Tan Soy Yong, 76, lay listlessly in bed. But when Madam Noriza A. Mansor walked into the room, his face lit up and he raised a hand in greeting. The 50-year-old bedsheet promoter is no blood relation of Mr Tan's but, for more than a year, she has spent most of her days off looking after him. Their relationship started in October last year when she helped Mr Tan, who had soiled himself while buying groceries with his wheelchair-bound wife. Others in the Toa Payoh supermarket recoiled from the old man and the stench. But Madam Noriza not only bought him a new pair of shorts but also knelt to wipe faeces off his legs. Since then, she has spent nearly all of her days off - she usually gets only one rest day a week, if at all - visiting Mr Tan. In the first half of the year, when he was living in a three-room flat in Potong Pasir, she took food to him, did the household chores and cleaned him up as he has poor bowel control. Whenever possible, she also took him by taxi to see his wife, Madam Lee Bee Yian, also 76. She was warded at the Tan Tock Seng Hospital for cancer at the start of the year and later moved to a nursing home in Paya Lebar. Madam Noriza, a single mother with five children aged 11 to 26, said of the couple: "I see them as my parents." She herself was orphaned when she was 21. In July, Mr Tan wandered out of his flat and did not return. Madam Noriza said he was later found by the police by the roadside, asleep in his wheelchair. Asked for his address, he could not remember. He was taken to Tan Tock Seng Hospital, where he was diagnosed with dementia. For three weeks, Madam Noriza knocked on the door of an empty flat. "I stood on tiptoe to look through the window and shouted his name," she recalled. "I was scared that he had fallen." Neighbours told her that he was no longer at home.She tried to call his social workers but was bounced around; she finally tracked him down at the hospital. After being discharged from hospital around September, Mr Tan stayed in a Buangkok nursing home. Now he has been reunited with his wife at another home in Serangoon. They are warded near each other. It is understood that Mr Tan's stay at the home is supported by his sister, who lives in Brunei and was contacted by social workers after his hospitalisation. Said Madam Noriza: "I'm very happy that they (Mr Tan and Madam Lee) can be together in the same place. I'm now also able to visit both of them at the same time." When The Straits Times accompanied her to visit the couple last week, she chatted with them in a mix of Hokkien and Malay while they tucked into the fried noodles and chicken wings she had brought for them. It had been three weeks since she last saw Mr Tan. Madam Noriza explained: "I didn't have any days off because we were so busy with roadshows." Looking down fondly at the old man lying in bed, she said: "I'm so happy to see him again. He's lost weight, though." Asked if she would keep visiting the couple now that they have full-time care, she said: "Of course. It's harder now because I don't have so many days off and they are very far from where I live, in Tampines. "But I will always make time for them. How can I not?" She then got Mr Tan to change into the clean shorts and asked him to sit on a nearby brick ledge, while she knelt before him and started to wipe the faeces off him. SINGAPORE - Ms Noriza A. Mansor, 49, was a total stranger to Mr Tan Soy Yong, 76, who had soiled himself while grocery shopping. But that did not stop the bedsheet promoter from reaching out to help the elderly man. She cleaned off the faeces on Mr Tan, bought him a new pair of shorts and even accompanied him home. This act of kindness took place last Tuesday at the FairPrice supermarket at Toa Payoh HDB Hub, and was reported today in The New Paper. Ms Mansor, who works at the supermarket, had noticed that people around her were pinching their noses and looking uncomfortable about a foul smell in the air. She went about trying to locate the source of the stench, and found that it was coming from Mr Tan, who was standing at a cashier’s counter with faeces on his shorts and shins. There was also a small lump of faeces on his sandals. Mr Tan had soiled his pants while grocery shopping with his wife, Madam Lee Bee Yian, 76, who was in a wheelchair. “No one was helping him even though he looked so pitiful,” Ms Noriza told The New Paper. People were steering clear of Mr Tan and even his wife was complaining about the problem he had created, but Ms Noriza rose to action. She bought him a new pair of shorts from a store opposite the supermarket, and went to the FairPrice staff toilet to get a pail of water and some tissue. She then got Mr Tan to change into the clean shorts and asked him to sit on a nearby brick ledge, while she knelt before him and started to wipe the faeces off him. She also rinsed out his dirty sandals. All the while as she did so, she kept talking to Mr Tan. “I was telling him not to worry and that he would be clean very soon,” said Ms Noriza, a divorcee with five children aged 10 to 25. When she was done, she accompanied the elderly couple back to their flat in Potong Pasir, before heading back to work. Ms Noriza’s kind act was observed by currency trader Goh Rong Ren, 32, who was rushing off to a dinner appointment with his friends that day when a passer-by asked him to help Ms Noriza and the elderly couple. He helped to pay for the couple’s cab fare home, and was so touched by Ms Noriza’s compassion towards Mr Tan that he wanted people to know about what she did. He then got his friend to contact The New Paper. “Her selflessness towards a total stranger moved me. It was pure and unadulterated kindness,” he said. For the full story, read today's The New Paper.